A comprehensive multilingual learning and discussion platform through which researchers, authors, publishers, and academic societies globally can learn about all aspects of scholarly publishing, stay updated about the latest trends in publishing, share opinions, and seek and receive expert advice. Good research is built on the foundation of good publication practices. Editage is committed to helping researchers understand these publication practices and to helping journals engage in open dialogue on issues concerning the research sphere. 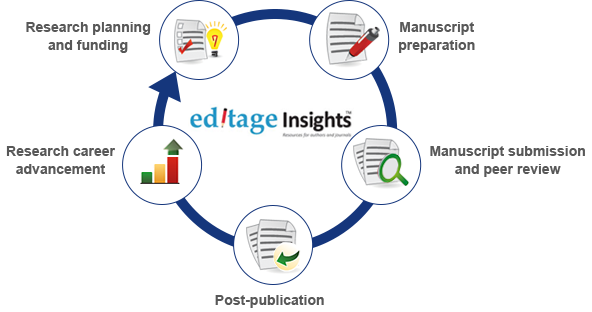 Editage Insights - Resources for Authors and Journals - plays a key role in helping Editage live out this commitment. Our resources are designed to help you learn more about each stage of the publication cycle. Editage Insights also includes updates and discussions on industry hot topics and interviews with experts in the publishing industry. Have a question about academic publishing? Confused about how to handle a tricky situation? Post your question related to the publication process, new trends in the industry, publication ethics, and beyond. Send in your question now and see how others in the academic community react to it. And of course, someone from Editage Insights’ team of publication experts will be there to guide you with their expert view.